This recipe is taken from the Moosewood Restaurant Cooks at Home book. It is really refreshing and is great for sharing. The version below is a twist on the recipe from the book. I will make a few recommendations for substitutions as I go along. Before beginning make sure you have about 20 minutes available for cooking. Boil a large pot of water. While the water is heating up, mix the sauce together until smooth. If you have a food processor I strongly recommend using it to create a smooth consistency. Set aside. Cook the noodles in the boiling water until tender but still firm (al dente). Drain the noodles and then douse in cold water. Then drain again. Now you are ready to toss everything together. In a large bowl, toss the noodles with the sauce, scallions, cucumbers, and if using, tofu. Place the above mixture onto a bead of whatever you green you chose (spinach or lettuce) and serve immediately. Any of the noodle portion not being used should be immediately refrigerated. 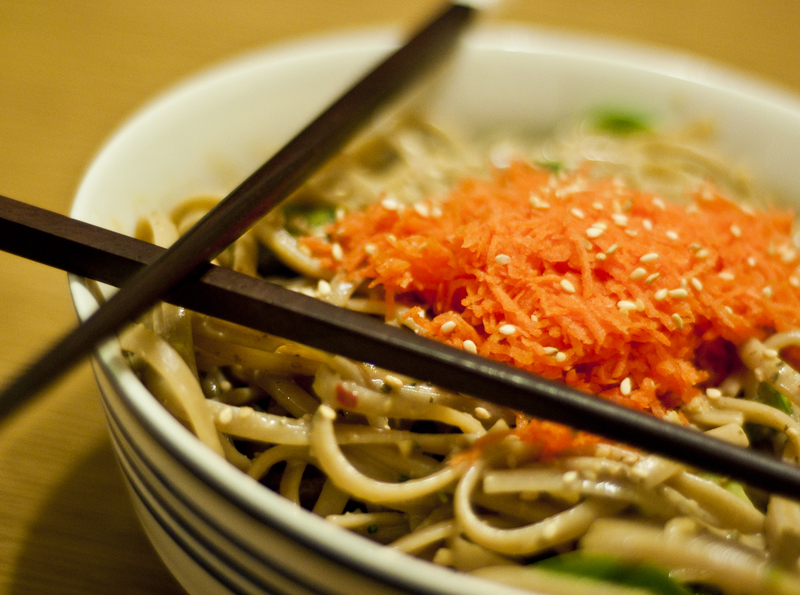 Top with the grated carrots, mushrooms (optional) and sesame seeds (optional but strongly recommended). If you don’t like cold tofu, and I don’t, then I strongly recommend substituting with another veggie of your choice. P.S. Technically this is considered a main dish salad. Realistically it is considered awesome. I made this tonight and it was delicious! I made a little modification in that I served it hot because I just felt like something warm rather than cold, and so I didn’t put it over any greens either. I also didn’t use the tofu and used broccoli like you recommended. This is definitely going to be a regular dish for me 🙂 Thanks!